Tonight’s full harvest moon will be fat with abundance and reward. A ‘reap what you sow moon’. Rising low and big in the sky, it provides the perfect back drop for a little moon magic. And what better thing to celebrate and welcome with this moon than prosperity. When I say prosperity, I don’t only mean money and material prosperity, although of course a little extra money is always nice. But I mean too truly prosper….in our relationships, in our endeavours and in our wellbeing. Too glow with abundance, and contentment and to share this sunshine with others where we are able. So often people strive for more and more and lose sight that sometimes we have enough. We are enough. We are prosperous. We have what we need to thrive. 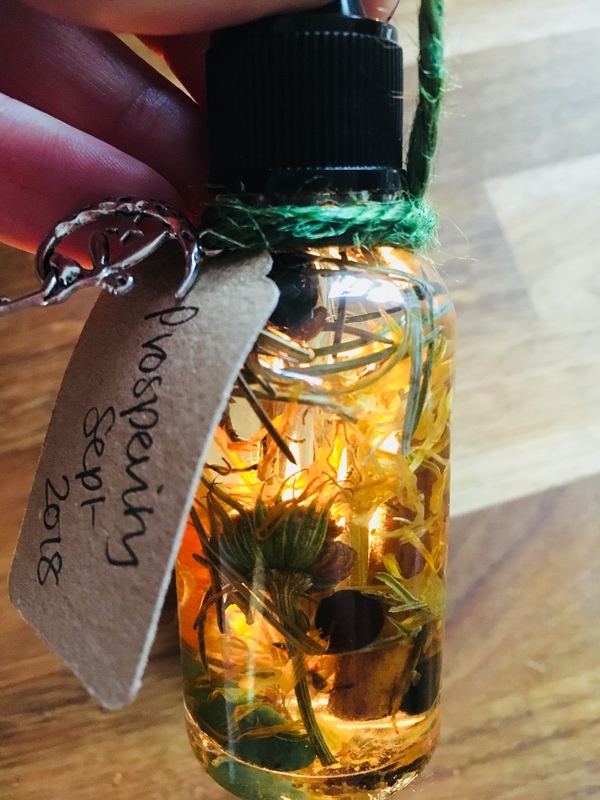 So, I crafted this little oil, especially for the full harvest moon to welcome, encourage and enhance those feelings of prosperity. To welcome abundant relationships, successful endeavours and to be grateful for what I already have. It is a foundation oil, of feelings to be built upon and it is a huge bonus that it looks like a little bottle of sunshine. I used fractionated coconut oil, as it is beautifully clear and non-greasy. I used a few crystal chips associated with prosperity – adventurine and tiger eye, and I used a dried flower base of calendula and pine needles. When the moon was new I gathered sage and cut orange peel to dry, and have also added these to the oils, as well as juniper berries. I will use the oil by adding a few drops to an oil burner over the coming days and by using a few drops on my wrists when I feel the need of an extra boost in my general feelings of prosperity and thankfulness for all I have. If you don’t have the tools to make an oil, then a simple full moon spell is to place a single white flower in a cut crystal or clear glass vase under the light of the moon. Light a small tealight and make a wish for something you would like to prosper and then let the tea light naturally burn out (please have it somewhere safe) under the light of the harvest moon.